The 14th race on the 2011 Nationwide series schedule, the competitors of NASCAR's second-highest touring division enjoyed a solo outing away from the Sprint Cup series at Chicagoland Speedway. With only three drivers (Kevin Harvick, Brad Keselowski and Carl Edwards) trailing away from a Sprint Cup series weekend to compete in Saturday's STP 300 on the 1.5 mile oval, the NASCAR series regulars as well as other aspiring stock car drivers stood poised to post strong showings within the 200-lap race. After enduring a rain shower that has previously washed-out qualifying, the STP 300 started with the JR Motorsports #88 Chevrolet of Aric Almirola and the Kevin Harvick Incorporated #2 Chevy driven by Elliott Sadler leading the 42-car NASCAR Nationwide series based on the season's car owners' points standings. Almirola held an early lead at Chicagoland but would quickly fall into the clutches of one of the Sprint Cup series visitors. In a hurry, Sprint Cup regular Carl Edwards took the lead on lap 9 after starting 4th in the event. Leading for 144 of the 200 race laps however, the #60 Ford of Edwards asserted total control of the Chicagoland Speedway event. Against the dominanace of Edwards through much of the STP 300 race distance, Elliott Sadler was able to muster the lead for the second-most laps for a total of 29 circuits. 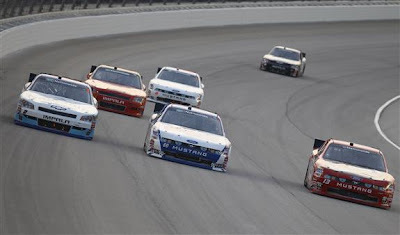 Slowed only four times by caution, the 300-mile distance flew by on the racetrack with eventual result of only 9 cars finishing on the lead lap. With the final yellow flag getting displayed on lap 140, the STP 300 at Chicagoland Speedway took on the complexity of a fuel economy run to the finish line. Into the final laps, Carl Edwards and Justin Allgaier driving the #31 Chevrolet for Turner Motorsports had taken the top-two positions both running desperately short on the E20 blended racing fuel. Going down the backstretch through the final lap, the #60 Ford of Edwards began to hiccup starving for fuel giving Allgaier the opportunity to pass. On his way to a skillful victory through turn 3 and 4, the #31 Chevrolet suddenly ran its fuel tank dry. Coasting on the apron down the frontstretch, Allgaier stayed ahead of the still enduring Edwards car to win the STP 400. Strongly seated in the top-10 with Carl Edwards, Roush-Fenway Racing wing man Trevor Bayne was once again a force in the NASCAR Nationwide Series after being sidelined for a long stint due to a complicated illness. Bayne's return to the STP 300 at Chicagoland Speedway was the 2011 Daytona 500 winning driver's first time back in a NASCAR competition since the April 23rd event at Nashville Superspeedway. In a better situation on fuel, Bayne stood a chance to claim a first NASCAR Nationwide series win if the race went one lap longer. 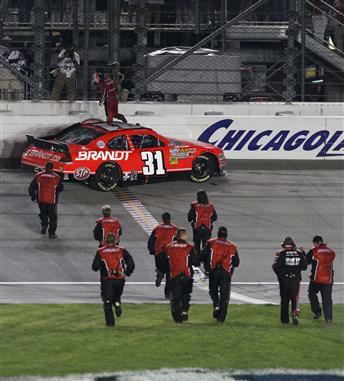 Justin Allgaier's victory at Chicagoland Speedway is the driver's second career victory and second win of the 2011 NASCAR Nationwide Series for Turner Motorsports. Ironically in similar last-lap pass fashion, Mark Martin won at Texas Motor Speed for the team when Brad Keselowski blew a tire while leading. Overall, the Turner Motorsports Chevrolets prevailed nicely at the checkered flag with Allgaier's teammates Jason Leffler and Reed Sorenson both claiming top-10 finishes. Leffler came home 5th while current NASCAR Nationwide Series points leader Sorenson finished 6th in the #32 Dollar General Chevy. Sorenson holds a tight 2 point lead ahead of Elliott Sadler and rests only 6 points forward of Ricky Stenhouse Jr.
Other notable finishes when the top-10 of the STP 300 includes a 7th place run for Kenny Wallace and an 8th place result for former JR Motorsports driver Kelly Bires. Speaking of JR Motorsports, IZOD INDYCAR Series driver Danica Patrick finished 10th in his one of her select NASCAR Nationwide series starts for 2011. Patrick's second top-10 career run in the #7 Chevrolet comes as rumours swirled last week at the Indianapolis Motor Speedway the popular driver was going to NASCAR full-time in 2012. Presently having an equity stake in her own INDYCAR team with Andretti Autosport, her current contract will still have a year remaining after this season. Danica Patrick has yet to confirm her plans for the 2012 racing season. Presented with a weekend-off, the 2011 NASCAR Nationwide series will next race on June 18th rejoining the Sprint Cup series companionship at the Michigan International Speedway.